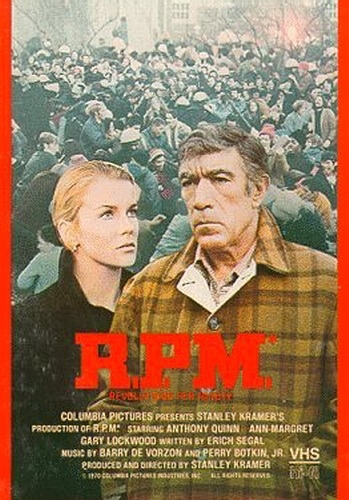 For my next return-to-college film, I ended up watching R.P.M. Like both Getting Straight and Zabriskie Point, R.P.M. was released in 1970 and deals with political unrest on campus. Directed by Stanley Kramer (who also gave us such respectable and middlebrow liberal films as Guess Who’s Coming To Dinner and Judgment at Nuremberg), R.P.M. takes place at prestigious college. Students radicals led by Rossiter (Gary Lockwood) and Dempsey (Paul Winfield) have taken over a building on campus. When the university’s president goes to confront the students, one of them yells out, “Buzz off!” Well, you know how sensitive college presidents are. He quickly resigns his post and the students demand that he be replaced either by Che Guevara, Eldridge Cleaver, or Paco Perez. Unfortunately, Guevara is dead and Cleaver is in Algeria. Fortunately, left-wing sociology professor Paco Perez (Anthony Quinn) is available and he just happens to teach on campus! Perez is named interim president of the college. Now, Perez has to bring peace to the campus, despite the fact that the protestors now see him as a sell-out because he accepted the position. Perez also has to deal with nonstop snarky comments from his girlfriend, a grad student named Rhoda (played by Ann-Margaret). Especially when compared to Getting Straight and Zabriskie Point, R.P.M. is something of a forgotten film. I haven’t found many reviews online and the majority of them mostly seem to focus on the fact that the film is dated and that director Stanley Kramer’s portrayal of the student protestors is incredibly negative. And, in many ways, those criticisms are perfectly valid. And yet, with all that in mind, I still loved R.P.M. Of the three 1970 campus protest films that I watched last weekend, R.P.M. was my personal favorite. Why do I so love R.P.M? Well, let’s check out some of the dialogue. When Paco asks how long it will take for the protestors to peacefully leave the building, one of them loudly announces, “It would take to the 12th of never!” Of course, everyone applauds. But even better than listening to the protestors is listening to Paco and Rhoda discuss their relationship. Seriously, how can you not love a movie with dialogue this overwritten and over-the-top? It’s obvious the Kramer and screenwriter Erich Segal were desperate to sound hip and contemporary and, as a result, nobody speaks like a normal person. Instead, listening to R.P.M. is a bit like listening to a party to which every 60s stereotype has been invited. And yet, it’s not just the dated dialogue that causes me to love R.P.M. As opposed to the histrionic Getting Straight and the artistically detached Zabriskie Point, R.P.M. is an attempt to seriously deal with the issue of student protest. For every three moments that ring false, there’s one that works and that’s a lot more than most films about campus unrest can say. Anthony Quinn gives a good performance as a man who doesn’t realize quite how complacent he has become. He and Gary Lockwood have a wonderfully tense scene together where they sincerely and intelligent debate their different worldviews. It’s the best scene in the film and one that is so well-done that it excuses any previous missteps. R.P.M. occasionally shows up on TCM. Keep an eye out for it. This entry was posted in Film, Film Review, Guilty Pleasure and tagged Ann-Margaret, Anthony Quinn, Film, Gary Lockwood, Lisa Marie Bowman, movie, Paul Winfield, review, RPM. Bookmark the permalink.